At Apple's fall event today, the iPhone Xs is certainly stealing the show, and not just for sharper screens and cameras. As rumors anticipated, the new devices will finally get eSIM technology, which had been available in iPads and Apple Watches but not the company's smartphones. That's not all: The Xs will also get the ability to juggle dual SIMs. The iPhone Xs will also come with a feature called Dual SIM, Dual Standby: When a line is called, that becomes the active SIM. Apple showed a list of carriers including big names like Verizon, AT&T, and T-Mobile that will eventually support dual SIM, while the Xs will support it after a free update sometime in the fall. There's plenty of reasons users would want dual SIM capability, like reserving one line for business and another for personal use on the same phone, or for people who use prepaid cards. It can also come in handy when traveling to load up SIMs from regional carriers. Editions in the US and elsewhere that support eSIM tech will include one physical SIM and one eSIM. 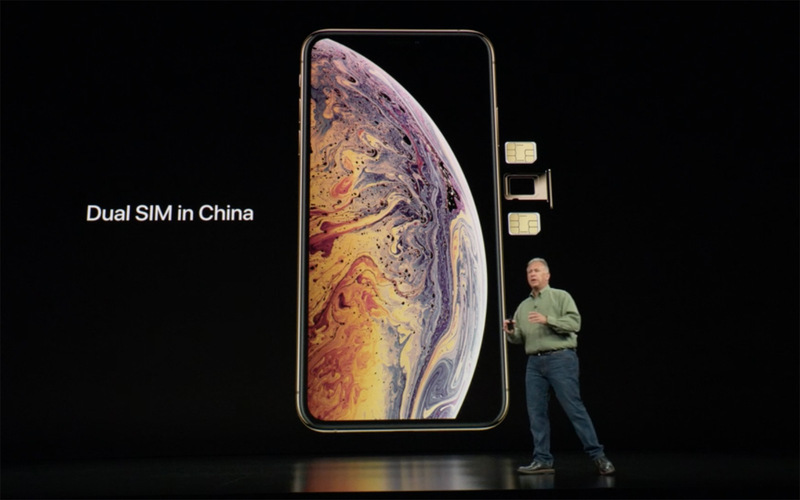 But for China, where the electronic SIM hasn't caught on yet, Apple is releasing a distinct Xs version with slots for two physical SIM cards. That's how important the Chinese market is to the company, but this model could filter out to other areas around the world that haven't adopted eSIM.